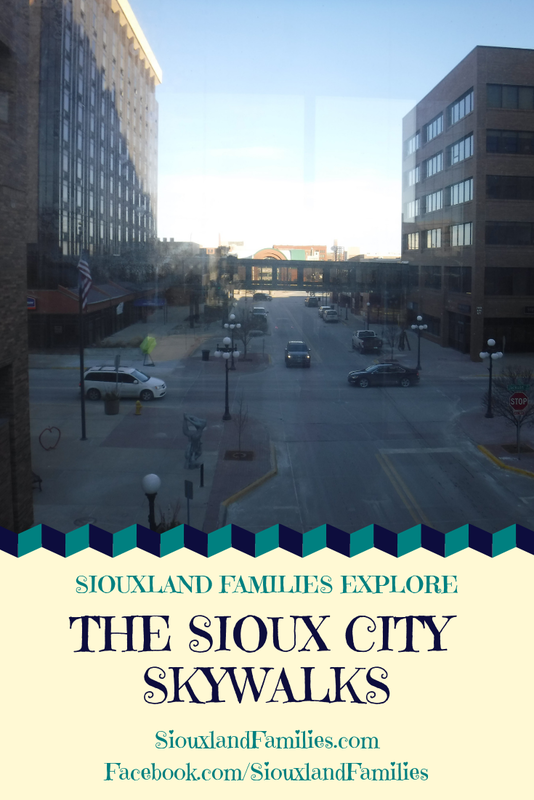 If you're looking for things to do in Sioux City when the weather is particularly cold, hot, windy, or otherwise unpleasant to be outside in, you might be forgetting one of our best options: the skywalks! 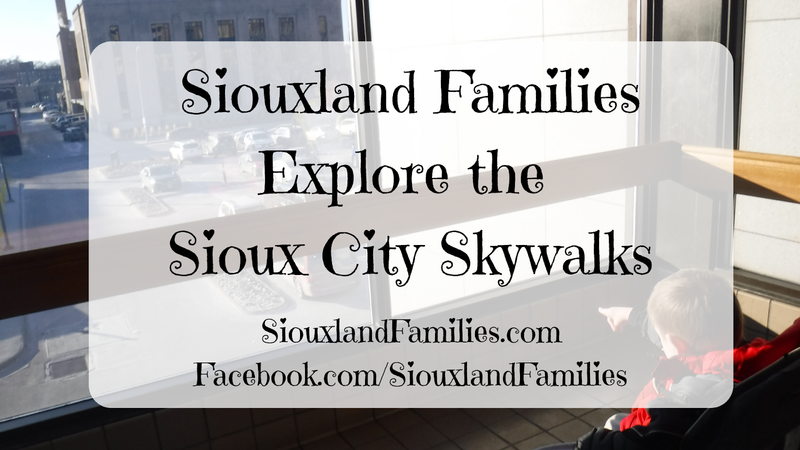 What are the Sioux City Skywalks? The Sioux City Skywalk System is a group of connected, elevated indoor walkways downtown, and walking in the skywalks is free and open to the public! I did a bit of research and learned that elevated sidewalks have a long history. Some scholars think they have their roots in the walkways atop ancient walled cities across the globe, and in renaissance architecture. Others cite the 13th century elevated sidewalks of Chester, England as the first example of a modern skywalk. Either way, it's an old idea that experienced a resurgence in the Midwest in last quarter of the 21st century. Today, only 25 cities in the US currently have skywalks, and some of those are just within one building or a few blocks. At 12+ blocks, Sioux City is one of the top 15 most extensive skywalk systems in all of the USA! Where are the Sioux City Skywalks? The Sioux City Skywalk system transverses buildings in downtown Sioux City, Iowa, in the area bordered to the north by 6th Street, to the south by 3rd Street, to the west by Pearl Street, and to the East by Jennings Street, including the Sioux City Public Library downtown branch, the Sioux City Orpheum Theater, the Martin Luther King Junior Transportation building, the Ho-Chunk Center, the Sioux City Convention Center, MercyOne Hospital, HOM Furniture, Mid-American Energy, and more. 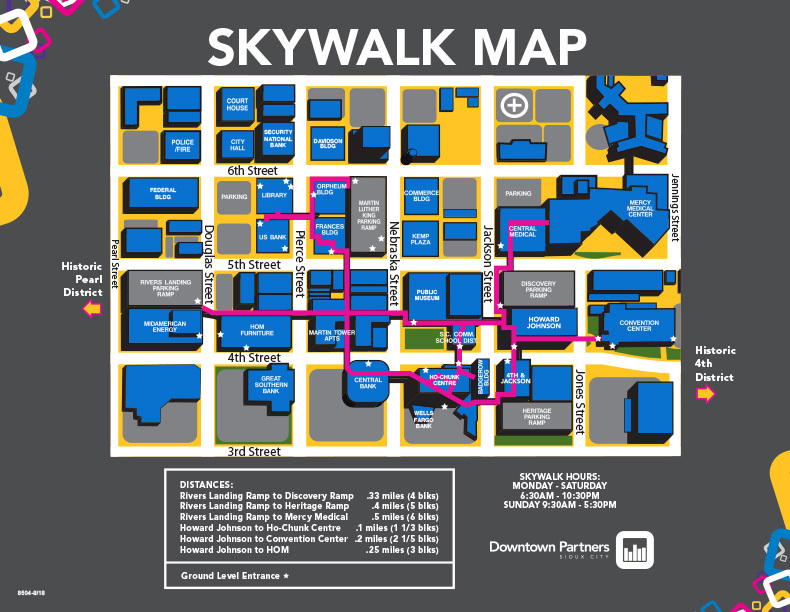 The Sioux City Skywalk system connects 12-14 blocks of downtown (depending on how much of the 3 city blocks covered by MercyOne hospital you want to count.) I have not yet heard whether the new hotel being built next to the Sioux City Convention Center will be connected by skywalk. The Sioux City Skywalk System is a partnership between the city of Sioux City and the businesses that own and operate the buildings the skywalks go through. When are the Sioux City Skywalks open? 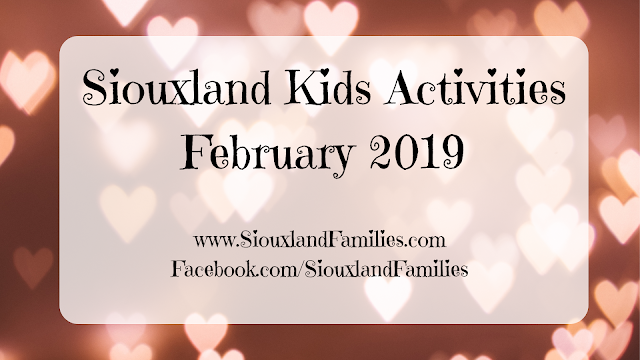 The Sioux City Skywalks are open to the public from 6:30am to 10pm on Monday through Saturday and from 9am to 5:30pm on Sunday, but not all buildings with entrances are open that long, so be sure to check the hours of your planned entry point. Also, while there are many entrances, not all are near elevators, so keep that in mind if you are bringing a stroller. Once in, you can walk through a wide variety of buildings downtown and across streets in the skywalk bridges. You can walk for about a half mile before turning around on some of the longest routes! There are offices and other businesses in the buildings, so in a few bits it is important to be quiet. There are also a few places where the path inside a building may overlook an atrium and falling over the wall would be dangerous, so keep an eye out for those places and make sure toddlers and preschoolers are holding your hands or being carried (or in a stroller or carrier). The skywalk system is patrolled by security guards to deter loitering and dangerous or disruptive activities. Skateboards, scooters, bikes, and anything else with wheels other than wheelchairs are prohibited in the Skywalks (the Sioux City Municipal Code doesn't list strollers as allowed or prohibited, but I have used strollers in the skywalks many times personally and am guessing they are allowed just like wheelchairs--I will check with the city council and update this post if I get clarification!) 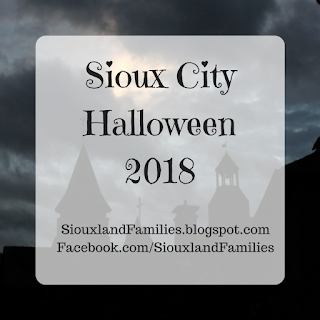 Gatherings of large groups of people are also not permitted in the skywalks, unless special permission is granted (the Sioux City Public Museum occasionally hosts walking tours of downtown architecture from the skywalks!) There is one café and several vending machines along the way. 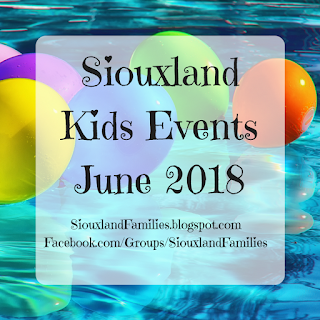 The convention center is a great turn around point for maximum exercise, with the Sioux City Promenade Theatre and Jitters donuts just a bit beyond the convention center, if weather is okay for a bit of walking outdoors! There are currently no exhibits on the skywalk level, but you can see down to the museum on the first floor. My 9 year old says that seeing the museum airplane through the second floor windows is his favorite part of the skywalk. To get to the first floor of the museum, use the elevator in the School District building and you'll have to walk less than a block outside to get to main entrance of the Sioux City Public Museum. This coffee and sandwich shop inside the Ho-Chunk building and run by the Ho-Chunk development company is currently the only eaterie in the Sioux City Skywalk system. Full review coming soon! The skywalk would be such a fun way to get to a doctor's appointment or to visit a friend or relative! The art center is a bit further from the skywalk system than some of the other fun destinations, but the closest exit with an elevator nearby is the Central Bank building. I would love to see the city extend the skywalk all the way to the art center someday! I think the skywalk system is one of the most underrated Sioux City attractions. My favorite hallways are the ones with photography or art on them, and I would love to see more of the walls filled with historical photos and with art. My 9 year old's favorite part is the museum, and I would love to see more Sioux City Public Museum exhibits visible from the second floor. My 6 year old's favorite is the MLK Jr. Transportation Center, where you can look down through a window at the buses coming and going! I would also love to see the skywalks extended to reach a few more destinations like the Sioux City Art Center. I think the Sioux City Skywalk System is already cool, but has the potential to be a truly unique Sioux City destination! It's definitely a great option to have, whether you're trying to get from one place downtown to another, or just need somewhere to go for a walk when it's too hot, cold, or windy outside to walk around outdoors. This portion of the Sioux City skywalk that would be a perfect canvas for some art! Greta from the Pickles Travel Blog shares the scoop on the Minneapolis Saint Paul Skyway, the largest in the world! 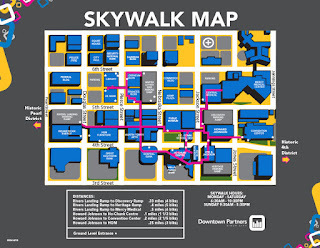 Des Moines Outdoor Fun offers tips on "Hiking in the Downtown Des Moines Skywalks"
For more maps and information on the Sioux City Skywalk System specifically, you can check out the Sioux City Downtown Partners website or the Parking and Skywalk System Board of Trustees.